And I thought that my 1966 Lincoln Continental Coupe was long at 18.5-feet, this 1976 Cadillac Eldorado limo, American Dream, is 100-feet long! That’s 5 1/2 Lincolns! 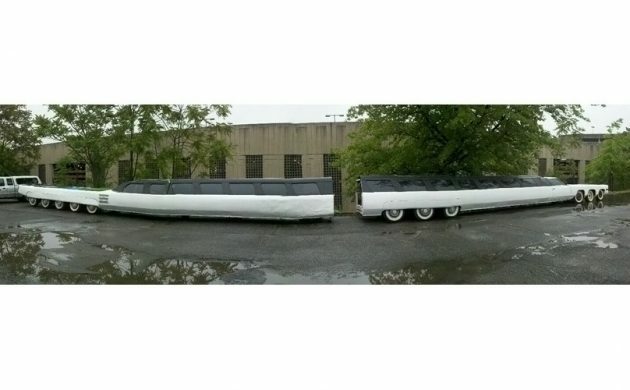 This behemoth can be found here on eBay in Baldwin, New York with a current bid price of $5,700 which has to be a tiny, tiny fraction of what it cost to build this big, big, custom limousine. There is no reserve so the high bidder is taking this one home, on at least two very long trailers. 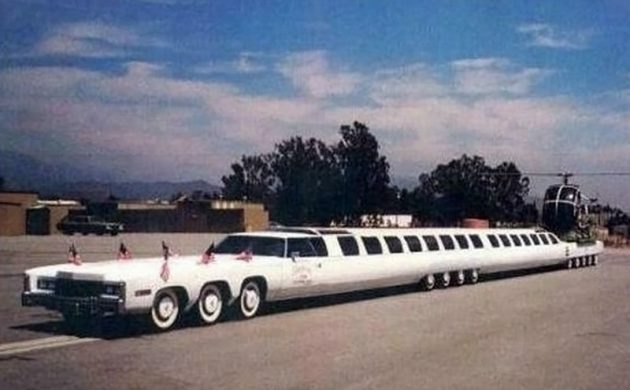 This Eldorado limo is, in fact, the world’s longest car at 100-feet in length, according to the Guinness Book of World Records. It has 26 wheels, two engines, and you can see one of the best features in the back: it has its own helipad! Ok, big deal, who doesn’t have a helipad on their car. It has a hot tub which you probably already guessed, but it also has a swimming pool with a diving board. Do any of you have a king-sized waterbed in your car? Did I mention the putting green? It has one of those, too. It has multiple rooms but there are no interior photos in the listing and only some very medium-to-low-quality photos, which is incredibly strange for what was once the nicest limousine on the planet. 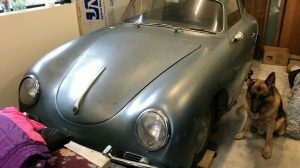 The seller has provided a link to the gentleman’s site whose team built this amazing car and it’s fascinating to see the work that went into creating this custom. I think the above photo is what the car looks like now if I’m reading the seller’s listing correctly. 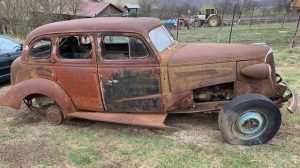 It looks quite rough and I can’t imagine the restoration cost for a one-off 100-foot-long limousine with two engines and multiple-rooms and everything else. I can barely handle restoring a minibike. This limo is in two separate pieces as you can see, and shipping it back to your shop will be expensive. I’m guessing that driving it home isn’t an option unless you live in a straight line from where the seller lives. Can this thing turn a corner? It’s longer than a semi-truck-and-a-half, that’s long. 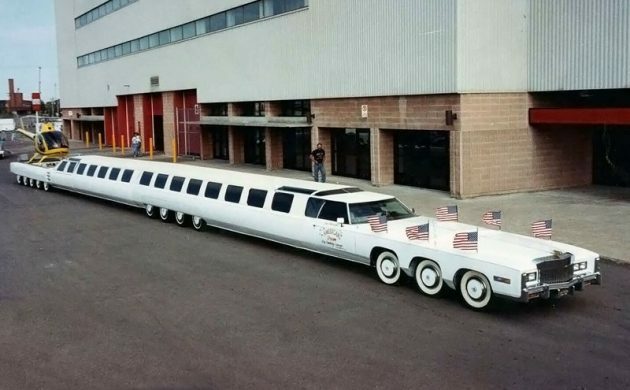 What would you use this American Dream limo for? Pure bull hunky. Without being articulated somewhere, it would never turn a corner, and you may run into bridge clearance problems with the chopper on. This has to be the ultimate for the American saying, “more must be better”. What some people P their money away on, simply astounds me. Shown all over the world for over a decade, builder was well-paid for its appearances. Sale closed at $1000. It’ll cost that much to move it. The auction was ended “because there was an error in the listing”. To me, that usually means that the seller had an offer which was accepted outside of the eBay system. No eBay transaction fees then… The highest canceled bid was $5800. Lots of build photos on the website so it is actually a thing. Built when cocaine and other judgement impairing drugs were a lot cheaper. It appears that both ends can function autonomously and are only connected together for shows and photo shoots. Never driven on any road, anywhere, at any time. Displayed all over the world for over two decades, Jay was well-paid for his efforts. The car broke loose in its freight containers during an ocean storm years ago and Jay let it go. It’s been in NY ever since. Belonged to “Big Daddy”Idi Amin, perhaps? where was this post on april 1? This belongs in a museum… I think the perfect museum would be the Pioneer Auto Museum in Murdo, SD. Somebody contact David Geisler! The other day I found a pic of this car sitting in a field falling apart. Why didn’t you publish both pics? I’m not sure what that means, boxdin? Did you send in this tip previously? People do need to think out the BOX every now and again. Your right Bruce it’s just to tempting to let it go. Whoops here it goes again. When painting a floor, one should always towards an unlocked door. No worries Boxdin, a little ribbing is a complement. You picked a fun name. It seems as though one of the center axles has gone AWOL. Funny that it has to be transported in two pieces. I wonder, just out of curiosity, what mechanism is used to hook the two ends together? Do all three front axles steer? All of the rear ones as well? So many questions…. I have to say, if this was ever capable of running/driving even on an interstate highway (super-long curves only) I would be very impressed. The name “American Dream” hardly applies for me. More like “American Nightmare”! your comment about the listing ending early is wrong. An error in the listing means, there was an error in listing. Vehicle no longer available for sale.. means they sold off ebay. Ebay fees for vehicles are paid when you list your vehicle. There are no extra fees when sold. Thus there is no way to ‘avoid’ paying the fees when listing a vehicle. Prolly the most interesting post on BF for me so far. I don’t think this was built to be driven unless you drove it on straight roads only. Gimmick or Guinness WBR? Bondo is erupting on this ship. Beyond insane, who thought of this. Apparently, the same guy who built the General Lee, KITT, and Doc Brown’s Delorean! Nope. Jay built CLONES of those cars, some even with licensing, which were displayed all over the world with paid appearance money. I’ve known Jay for over 30 years, he’s a good guy who filled a unique niche. That video gives a much more accurate representation of the vehicle’s condition than could be imagined based on the auction photos. Yes, the seller did say “come see it”, which was great advice. Something I noted was the appearance of the strength of the structure along the sides. Box tubing is sturdy! Something easy to see in the video is how plywood had been used in roof areas, etc, and had delaminated with moisture. Pretty ugly. I can’t see anyone seriously thinking that restoring this would be a good idea, or anywhere near a fiscally acceptable endeavor. What really strikes me though, is that with so much effort and expense going into the original construction, how could anyone just park it outside, subject to vandalism, stripping, and the elements? Jay Ohrberg has lived a charmed life. So many one off cars that he has built. He has had a greater impact than George Barris. All that Barris did was to undercut Dean Jeffries who was building the 1966 Batmobile out of a 1959 Cadillac 2dr. hardtop. I believe the show, Batman, was moved up in scheduling and they needed a car pronto. All Barris did was to take the former Ford Lincoln Futura show car, which was featured heavily in a movie about an USAF officer winning that very car in the plot, and painted it black with bat ribbing and red accents on the fins. My point is Barris’s stroke of genius was in his can-do attitude and his ability to take full credit for a design that was not fully his. You only need to change a design 2% for the patent office to see it as a new design. Dean Jefferies has gone on the record accusing Barris for claiming the Monkeesmobile GTO as his own creation, which has got to irritate the mud out you. Jefferies Monkees GTO was all his design. A blown, bright red, three row seat, heavily modified, 67 GTO convertible is outrageous. The time machine DeLorean was designed by Andrew Probert ala Airwolf helicopter, Star Trek: The Next Generation USS Enterprise fame. Looking at his website it is clear that Mr. Ohrberg can go toe to toe with some world class designers. 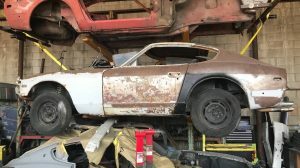 Thank you barnfinds.com for bringing this fascinating tale to us lowly slubs. Ridiculous. Why would anyone waste money building this? LMFAO!!!!!! Just because you might be able to doesn’t make it right.Just cut it up for parts and scrap. I have passed this on to the “House On The Rock” attraction in Wisconsin, that’s where it belongs! Ah, the ’80s… long ago and far away thank GOD. I’ve known Jay for over 30 years, was around when that beast was being built originally as a 60-footer as shown in the build pics. It ran and drove then, sorta, made the Guinness Book, and inspired competition from other show car guys. It was shown all over the world, perhaps tainting the worldwide opinion of Americans for generations. When another builder topped the car with a 70′ thing, Jay stretched the stretch to 100′ with a mostly empty interior and lesser quality throughout. As a 100′ piece it got on Johnny Carson once, and it did the world tour for years, deteriorating despite annual refinishing. Jay offloaded it years ago after it was badly damaged when it broke loose in its shipping container during an ocean storm. Seems it has sat in a parking lot near a Jersey port ever since, falling apart and getting sadder by the second. Maybe $5K worth of crinkly sheet metal and structural steel but I doubt it would fit in the crusher… in a week. Kill it with fire please. Not sure what part of the country you were living or what your circumstances were but I haven’t had a decent decade SINCE the 80’s. And they killed a 64-67 Vista Cruiser for this monstrosity. Must have been a slow day at BarnFinds for this story to surface. Show us what matters: stunning dirt laced and vermin-ridden Americana tucked away in a barn near the House On The Rock. Whatever your opinion, it has a place in history as an historic vehicle. It should be restored and parked in a museum. This car pops up on the Internet once or twice a year, usually a little sadder than the time before. It’s “glory days” are well in the rear view !! Wonder if that limo has its own bowling alley? This car has been sitting junked in an alley and for sale for years. not sure if I’ve seen it here but I think I have in the past. I thought Joe Walsh had finally come to his senses! Haha! I’d paint this up in BNSF livery and annoy the bleep out of everybody in my neighborhood. The first thing I thought was the Jurassic Park Principle…Just because it can be conceived doesn’t mean it should be built. I was going to come up with some glib remark. Then I looked at Jay Ohrberg’s website. This guy is prolific. Right up there with Ed “Big Daddy” Roth (Rat Fink creator), George Barris, Dean Jeffries and others. He was one of the kooky kreators of the kustom kar kulture of the 50’s and 60’s. He has had a very large impact on the hobby or dare I say discipline. Because that is what it is becoming a discipline. I would not be surprised if that limo was created for Evel Knievel to jump over and crash on landing. The people on his site are the who’s-who of the automotive arts. I am not crazy about the limo, but please let me know if he wants to sell his rolodex. I’ve known Jay for over thirty years, and you’re pretty close! Not as client-centered as GB, Jeffries and the others, he did his cars mainly for show tours around the world, for which he was well paid. He offloaded the limo a decade plus ago after it was severely damaged after breaking loose inside its shipping container during some REALLY rough seas, and I think it had served its purpose by then and was pretty tired. He might not have been all that sad to see it go away. Thing is, it was rather sturdily constructed, with structures laid out like a bridge. Stout stuff, and I’m not surprised that it’s still… um… horizontal after three decades. LOTS of metal to be melted down. And yeah, I think it really SHOULD go away. Feed it to a crusher for a few days and remember it in its glory instead of a really long pile of ugly and rust. RIP. I’m thinking that this car would be perfect for Kim Jong Un. He could make a pass in front of the grandstands, backup, make another pass. I grew up in Baldwin. There is no way that vehicle could get around town. Scam?? 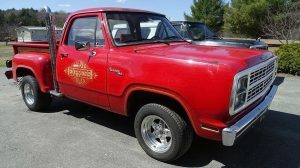 It’s not a scam; it was a SHOW car, never meant to drive around town. Which state will register this vehicle ? It would really be tricky if you said your address is in the center of the four corners region. It is so big that you might have to pay property taxes. Someone should paint the roof black and start launching RC airplanes off of it. Great stuff, great comments (mostly). Thx! As long as your destination is always on a straight road and you don’t have to take any corners, off-ramps, things like that, this car would be ok. Actually I have seen some dumb vehicles before and this one takes the cake and the only reason I can think for it to exist is so the owner can claim he has the longest car in the world. I do not understand the appeal of that, if in fact that was the reason. I do like the copter pad tho. 3 words. Just plain stupid. I seen when this car was made over 40 years ago. It was built specifically to be in the Guinness book of world records. They kept it out at an airport, and the only way it was drove was down the airstrip, and then put it in reverse and drove all the way back. I haven’t seen this car in years and I always wondered what happened to it.